I returned to NYC, for the first time in three years and the meeting was disrupted by what I came to call a plumbing incident. 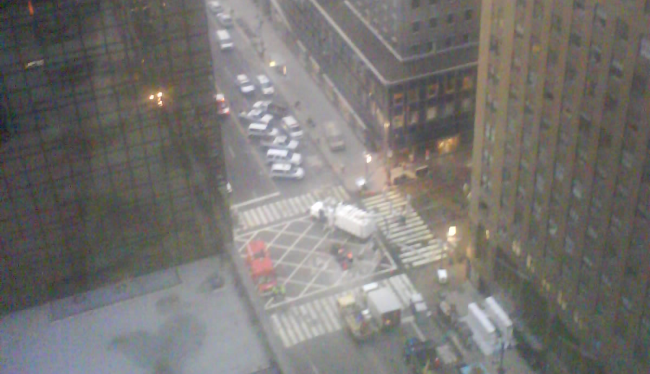 I was 200 yards away and 31 stories high when the explosion in New York happened last night. It was jolly noisy. I looked out my window and the building next door was shrouded in steam. I thought “That’s not meant to happen! I might be safer on the ground floor.” So that’s where I went. The area around Grand Central was closed down and the police and building security people were directing people away from the site, so it took me 30 minutes to get the Bogarts, which had reopened. So I had a couple of beers. In actual fact, it was a plumbing system failure, hot water was escaping from an underground pipe becoming steam. Originally posted on my sun/oracle blog, re-posted here, https://blog.davelevy.info in June 2016.